Our most popular kit. Called a "Rental" kit because of it's popularity with Rental Houses, this is the Dana Dolly Rental Kit with the "Universal" style Track Ends, in a custom Wheeled SKB Case with folding handle. 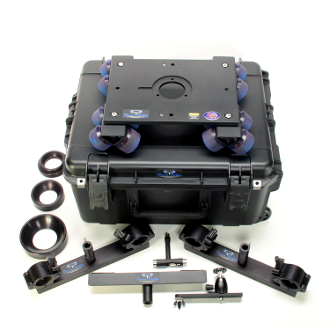 Includes: Dolly, 2-"Universal"-style Track Ends, 75mm, 100mm, 150mm Adapters, Center Support, Monitor Mount and Custom SKB Case. 24"x20"x14" 47lbs Loaded. Works with any size pipe from just under 1 1/4" (1.66" O.D.) to 1 1/2" (1.90" O.D.). Made in USA.